The recent destructive storms again indicated the need for trained, certified architects who can assist emergency responders and local government with recovery efforts and damage assessments in the immediate aftermath of such disasters. Organizations like the Red Cross and Salvation Army take donations of clothes and money to support those displaced by the disaster. Many individuals donate blood for the victims fighting for their lives at area hospitals. Government at all levels has first responders providing search and rescue operations to save lives. However, there is a unique contribution that an architect can make in such a situation and AIA Dallas and AIA Fort Worth have joined forces to create a Disaster Action Committee dedicated to preparing our members to fill that role. Although first responders provide search and rescue operations that many architects will not be able to participate in, there is a stage in the process where architects play a vital role – the recovery stage. Much of the destruction that occurs can be widespread and overwhelming for the local building officials to handle by themselves in a short timeframe. Lack of support to complete safety assessments often delays the return of displaced residents to their homes or results in their return to unsafe conditions. Due to the nature of disasters more common to Texas, a comprehensive assessment is required (not just structural). This creates an opportunity for architects to assist as volunteer second responders. To prepare for this opportunity to perform rapid assessments of structures in a disaster zone, training and certification is required. The education backbone of AIA’s Disaster Assistance Program is the building safety assessment program training based on ATC’s method, an industry standard. In 2008 AIA National collaborated with California’s Office of Emergency Services to adapt and adopt the California Safety Assessment Program (SAP). The AIA SAP training is an allhazards training for architects and other built environment professionals to perform building safety assessments. The program is managed by the California Office of Emergency Services (CAL-OES) with cooperation from professional organizations such as AIA and SEAOC. To prepare members and advocate for the architects’ role in disaster assistance, the AIA offers SAP Evaluator Training courses to its members as building safety evaluators. Authorized AIA SAP instructors share their professional disaster response experience in the classroom with examples and case studies. The one-day training course consists of an overview of the AIA program, a performance of safety evaluations, and tips for working as a volunteer after a disaster where both technical and emotional assistance will be required. 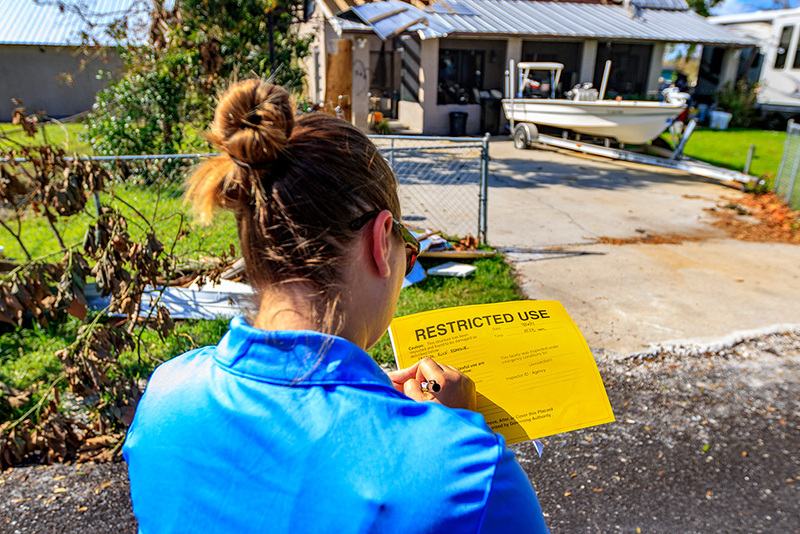 Students are taught what to look for and how, and are given step-by-step instructions for filling in assessment forms, including how to record a variety of building damage issues and circumstances. Local training sessions are often tailored to the type of development, construction, and hazards found in the region. Eligible candidates holding a professional license will be issued a picture ID for use during an emergency or disaster event. Only licensed professionals and building inspectors with acceptable training will receive the photo ID, but this does not prohibit other persons with related skills or interest from being trained and receiving a certificate of training. SAP Training certificate holders are often welcomed and valued members of the disaster assistance teams. Unlicensed professionals are eligible for the Coordinator designation and if the individual becomes licensed during the valid certificate period, the Coordinator may be eligible to receive the Evaluator certificate. Certified evaluators may elect to be added to the Texas Society of Architects Basecamp for information about deployment opportunities in partnership with the Building Officials Association of Texas. Jeramie is founder of Rittiluechai Architecture, is an active member of the Dallas architecture community, and has been involved with the Dallas chapter of the AIA for a number of years, volunteering as chair of the AIA Dallas Young Architects Forum (YAF), predecessor to the current Young Professionals Network, and as chair of the Disaster Action Group. Most recently, Jeramie Rittiluechai is serving on Texas Task force 2 as an Urban Search and Rescue Structural Specialist. Structural Specialists assess immediate structural conditions and assist with other duties working as first responders during disaster conditions. He is a certified Cal-OES instructor and leads many of the local Safety Assessment Program training sessions.